Sciatica is the irritation or compression of the sciatic nerve which originates in the lower spine and runs through the buttocks and down the legs. Although very painful, sciatica is the cause of an underlying issue which I explore here in this article. I also explain the value of exercise in helping to relieve discomfort and for management of sciatica going forwards. Sciatica is the irritation or compression of the sciatic nerve which originates in the lower spine and runs through the buttocks and down the legs. Symptoms are often pain of varying degrees described as burning or tingling or a sharp stab in and around the buttock and down the legs and can also be accompanied by numbness, tingling, a giving way of the leg or a sense of weakness. Pain may also worsen with sitting and can make walking difficult. Although sciatica can be debilitatingly painful the pain and irritation of the nerve is a symptom of the underlying cause which could be from a disc bulge or prolapse, disc degeneration, stenosis, spondylolisthesis, piriformis syndrome and sacro-iliac dysfunction. Any of these causes can compromise the exit of the nerve from the spine and compress it causing pain. The point I would like to emphasise here is the underlying cause - if we can get to the root of the problem and manage it effectively the symptoms of sciatica will go away. 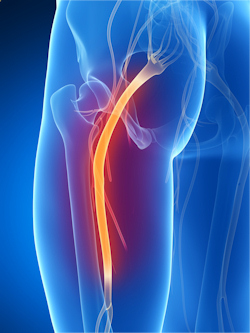 Often sciatica is caused by a structure like a disc pushing on a nerve. It is true you cannot fix structural damage but you can improve alignment, stability and strength of the surrounding area. Malaglined discs are often associated with poor posture or weakness of the surrounding muscles. Without wanting to complicate things further, an initial problem starting elsewhere in the body can cause the spine to adapt and change thus leading to sciatica. Ideally when treating an injury or chronic pain the body should be observed as a whole. This is where exercise becomes invaluable as part of a long term recovery plan for sciatica sufferers because corrective exercise can help realign poor posture and strengthen weak muscles. Stretching can ease off localised tension that a muscle takes on when the nerve begins to hurt. Exercise helps to strengthen weak areas of the spine, core and pelvis. This in turn can improve alignment of the spine and reduce the pressure on the nerves. As posture improves and the individual becomes stronger the chances of reoccurrence are reduced. John Medina explains in his book Brain Rules how exercise also helps to increase the growth of new blood vessels throughout the body to get deeper access into the tissues. This helps the tissues dispose of toxic waste that builds up in and around an injury and areas of pain. The more you exercise, the more tissues you can reach and the more toxic waste you can get rid of. Exercise actually physically aids your recovery. What exercise can I do? It is common to give stretches for sciatica because the affected muscles and the sciatic nerve itself can be stretched and this provides a certain amount of short term relief. sciatic stretches alone are usually not enough to make a long term change to symptoms. They are, however, a valuable inclusion in a bespoke series of exercises given to an individual. Stretching and mobilisation of the fascia (connective tissues) and nerve flossing techniques are also common inclusions for sciatica exercise programmes. Exercise for sciatica is focussed around relieving discomfort and realigning, stabilising and strengthening areas of weakness as well as opening up areas of tightness that are contributing to poor alignment. Finding out what the underlying causes are is imperative as it determines what exercise is needed. Exercises given for disc related issues are almost the opposite for stenosis and spondylitis. Ideally exercise should be bespoke to the postural needs of each individual. Ideally seek out a specialist in corrective rehabilitative exercise who can assess your whole body postural alignment. It is increasingly common to hear and see of patients doing their exercises poorly or completely wrong which can make symptoms worse. It is imperative to do your exercises with good form and it is advisable to do them under the observation of a corrective exercise specialist like we have here at Precision Movement. This is mainly because your body will have a preferred way (poor alignment way) of doing movement and with each repetition you do you'll need to remember and apply newly learned alignment to make desired changes. From personal experience of this in my practice, for the first 3-4 weeks each repetition of movement requires a correction of alignment from me to the client until they start to learn new patterns of movement and create programmes in the brain for the new alignment.